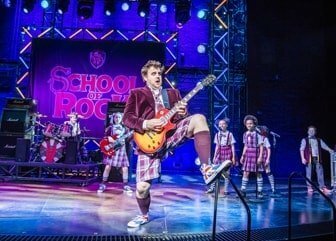 School of Rock opens with an announcement from composer Andrew Lloyd Webber. He said he is asked all the time whether the children really do play their instruments live. “The answer is an emphatic yes, they do.” Already, the audience was cheering. Our world needs a bit of the feel-good factor at the moment, and this is the ultimate feel-good musical. The 13 children, aged 10 to 13, are talented and joyous but so are the adults. 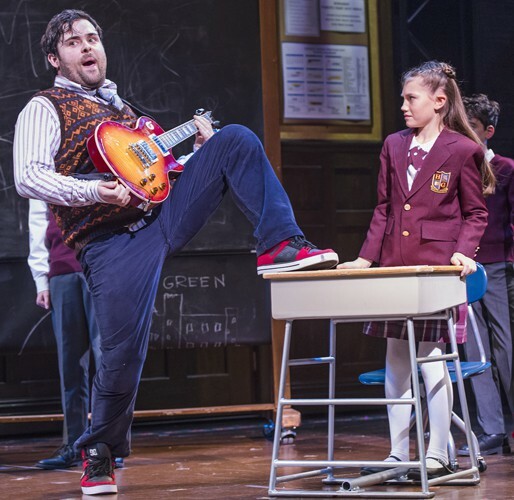 Ebullient David Fynn as wannabe rock star and imposter teacher Dewey Finn with the massively multi-skilled Rosalie Mullins commanding school and stage as head teacher Florence Andrews. Dewey is the classic anti-hero loser who turns everything on its head in his desperate attempt to get out of debt. “I’m so sick and tired of being the guy everybody comes to for the money I owe them,” he says. One of the sheer joys of this show is the book. Julian Fellowes’ wit saves the script from tipping over into the clichés that lie tempting in the wings for a plot of this kind, the bad guy making good, the good guys getting their come-uppance for being so smugly superior. The kids are at Horace Green, a super posh public school where parents expect a good return on the investment the put in with the fees. 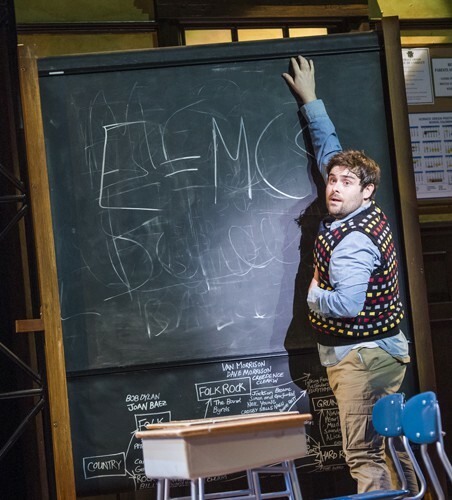 After Finn cons his way in, he tells the shocked children there will be no grades, no gold stars – no work at all in fact. Just play – musical play. Not all the kids are happy but he wins them round. There is a wonderful staffroom scene where all Finn’s colleagues wonder why the bad teacher is the most popular. Some of the most moving scenes are seeing these little children then, with his encouragement, take up instruments that are in some cases larger than them, and “stick it to the man” on this enormous stage in front of an audience of thousands at the New London Theatre in Drury Lane. In the show, as possibly in real life, these kids first dash and then exceed their parents’ expectations. 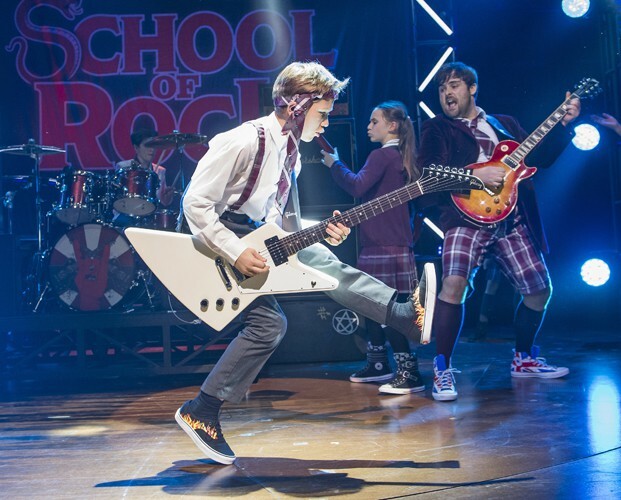 School of Rock is a high-energy show with great lines and tunes. To my surprise, I preferred this live show to the film. Tom Abisgold as Zack displayed superb technique on lead guitar with some great solos, moves and singing, not just on the stage but also standing on the piano. His parents and teachers must be beyond proud of this young man. The tiny Lois Jenkins with her long hair in cute bunches absolutely rocked it on bass, her little hand dancing up and down the neck of her enormous red bass, totally on top of every note. Madeleine Haynes showed some sassy dance moves as Marcy and Jude Harper-Wrobel beat the drums like a pro. Eva Trodd as Summer was the perfect, endearing A* bossy boots pupil. Nicole Dube as Tomika reduced more than a few of us to tears with her amazing Amazing Grace. A special word for Joshua Vaughan as Billy. Just wow. What a great little actor, what character. There are 39 children in all, because child licensing laws in the UK restrict child actor working hours so there are three teams who rotate. In addition, every night an extra team comes in to be on “standby” in case of illness or accident. 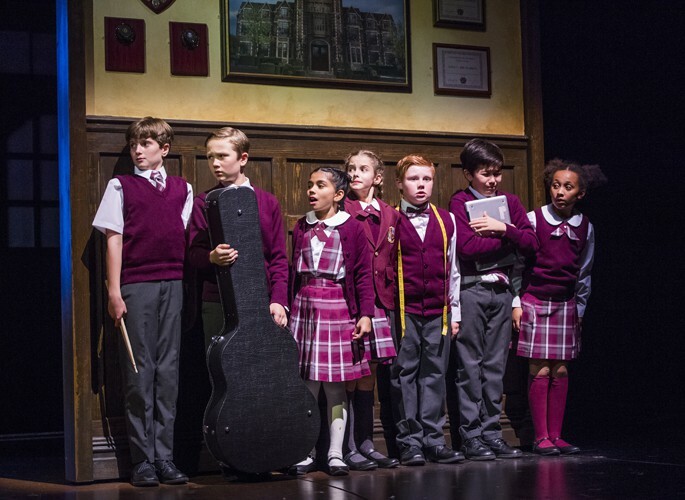 Already, children’s casting director Jessica Ronane, who also does Matilda and countless other West End shows, is looking for the next cast for when these children’s contracts run out, or when they grow too tall or the boys’ voices break. Lloyd Webber opened this show first in the US and one reason was it is easier to manage children there as the law is less strict and one team does everything. But while this might be a pain for producers and directors, one of the fantastic consequences of Britain’s child acting laws is that so many children get a chance in a show like this to star on a West End stage. It is almost overwhelming to see these little kids live on this stage, totally convincing as the people and instruments they play, giving it every single thing they have and more. At the end, we were all on our feet with a resounding standing ovation. It is one of the few productions on at the moment that I would happily go and see again. And again. 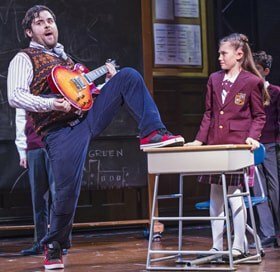 Book School of Rock Musical tickets for New London Theatre.